Traditionally, retailers have turned to Cloud solution to improve efficiency in their operations. And while the familiar Cloud benefits of shifting cap-ex to op-ex, reducing infrastructure and being able to focus on core business issues still apply, retailers can now expect even more of the Cloud: it has been proven to do more than just liberate them from the burdens of managing IT in-house. As such, Cloud deployments have evolved rapidly from a possible option to the preferred choice for a wide range of retailers seeking to “bake in” competitive advantages and the ability to capture emerging opportunities. The greatest overall challenge most retailers now face is adapting to change—both to the evolving expectations of shoppers and to shifting market conditions. The Cloud meets that challenge in ways that on-premises solutions can’t, by enabling faster deployments, more universal access, and easier, more fluid store, channel and chain expansion. It has become both a driver and an imperative of growth. As a consequence of its expanding role enabling efficiency and growth, the Cloud has raised the bar on competition between those who use it and those who don’t. It’s quickly becoming a “leaders vs. laggards” proposition, with current adopters forcing others to catch up to their more agile businesses or risk being outpaced. It also allows retailers to move into markets they might otherwise consider out of reach. These are a real and pressing concern that any retailer would be unwise to dismiss. Today’s retail Cloud meets the challenge of change in ways that on-premises solutions can’t, by enabling faster deployments, more universal access, and easier, fluid expansion. It has become both a driver and an imperative of growth. The same dynamic also impacts solutions providers, whose customers now expect rapid deployments and enhancements. Those that are already equipped to deliver this via the Cloud, with a broad range of full-function technologies, are at a distinct advantage over those who are just now getting on board. We’re also seeing a shift both in who is leveraging the Cloud and in how it is being used. Increasingly, more and larger retailers are looking to the Cloud for more than best-of-breed point solutions; they are now seeking fit-for-purpose, end-to-end, natively integrated software that can be implemented in the Cloud in a materially shortened period of time. Certainly, when compared to best-of-breed on-premises solutions, integrated Cloud platforms typically deliver faster ROI. However, as more and more retailers begin to evaluate the Cloud as a growth engine, they are learning that the economies of scale inherent in solutions that are designed to live and work together in the Cloud can turbo-charge that engine for even greater and faster results. Cloud platforms enable retailers to shift their attention (and resources) away from implementing, maintaining and interfacing disparate systems, and instead focus on how the technology, features and functions can drive growth in their organizations. The economies of scale inherent in solutions that are designed to live and work together in the Cloud can turbo-charge the retail growth engine for greater, faster results. The rise to power of the omni-channel consumer has created countless challenges for retailers in every category. However, as mentioned, one of the greatest threats retailers face in today’s market is the pace at which customer expectations change. New devices, new networks, new competitors and new options emerge constantly, and trying to keep pace with a collection of legacy on premise solutions is a slow, costly and disruptive proposition. That’s why agility matters, and why Cloud-based solutions are so well suited to today’s rapidly evolving retail environments. They allow retailers to respond to emerging expectations and shifts in customer demands quickly and at a much lower cost than traditional on premise solutions. In fact, at the risk of coining yet another “dash channel” buzzword, Cloud platforms allow retailers to transform from omni-channel businesses to open-channel businesses, because they truly are open to adopting new devices, new networks and new options as they emerge. And Cloud-based solutions that are truly integrated serve to break down channel barriers to enable singular commerce and seamless customer experiences. There’s obviously a big difference between recognizing the advantages of Cloud deployments and committing to pursuing them, by actually adopting the Cloud as the foundation for your omni-channel IT. As with any other technology or infrastructure investment, correct decisions are the product of considered evaluations and thoughtful plans. Start by examining the business case for moving to or expanding within the Cloud. Undertake a needs assessment to identify solutions that are not aligned with the efficiency demands of the business and the service expectations of its customers. Move on to a value assessment of an on-premises vs Cloud response, accounting for reduced footprint, risk and implementation requirements. Factor in improved flexibility and longevity, supported by update automation. Finally, consider the opportunity to add other integrated Cloud solutions over time. The results will be worth the effort. 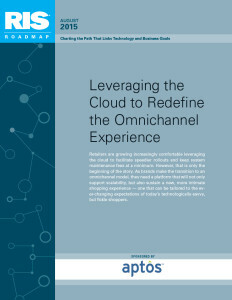 Retailers who develop and execute a roadmap for acquiring an advanced Cloud platform to support open-channel, unified commerce will be in a superior position to deliver all the efficiency their businesses require and the seamless experiences that today’s shoppers now absolutely demand.